Discussion of international community development began in the mid-1950s. While numerous United Nations papers and documents championed the idea, in the early days the practitioners preferred action over theory. The focus was on identifying strategies that work. Our viewpoint is that the field strayed from "what works" into "theory-building for fun" for a while. Now the pendulum has swung back to reality, thanks to a world where many millions of people are able to communicate their truths globally. Much further down on this page, we'll describe the original theory of international development, but we thought you would want to see right away how we're conceptualizing what needs to be done today. We sub-titled this little quick diagram with "the way it seems today." It is literally subject to change tomorrow. We urge all of you who are active on an international scale to think in terms of noticing your own perspective right now. Indeed judgments about all kinds of community development are subject to the struggle to shape a giant number of observations, experiences, and new data into a coherent whole. As we said, somewhere along the way, the UN and other major international organizations began to advance theories that began to obscure the variation in what constitutes effective community development in a particular setting and society. Now we will describe the academic and United Nations theory of community development that prevailed for a number of years. Then we tell what has changed in the 21st century and how we think about international development now. •	The notion of community itself is critical enough that building or developing community is seen as an important enterprise. If only tribes exist, community development doesn't become an issue. When groups try to form themselves into a unit to share a common infrastructure (roads, water sources, leadership) and to devote themselves to one or more types of income-producing activity (as opposed to finding or growing daily sustenance), there is a geographic community. But when the geographic community begins to influence individual destiny for good or ill, there is an opportunity for community development. •	People have a right to self-rule and self-determination about the form of that organization. This idea led to overthrow of colonialism, nation-building, attempts at democracy, and continuing efforts to organize nations and alliances along cultural, ethnic, and religious lines. •	Change is possible. It seems elementary, but when people are so downtrodden by extreme poverty, disease, war, desertification, extreme isolation, enslavement, or oppressive government that they cannot see this point, it's very unlikely that any type of international community development will occur. •	External change agents are necessary before community development can occur. There is a tendency in international community development discussions to believe that "help" from the outside is needed. That might include financial assistance or technical assistance in the form of advice and instruction in techniques, but this is often a core belief in the crowd that discusses such issues. •	Everything is connected to everything else; thus a holistic approach to international community development is appropriate. Professionals who consider themselves as community developers think this way, and indeed in past decades it was popular for them to identify with systems theory or other attempts to describe nearly everything. But ordinary citizens don't necessarily think this way. So it's very common for volunteers, untrained leaders, and governments to adopt piecemeal approaches. Piecemeal measures are also easier politically, financially, and logistically. •	Any community participation that is encouraged or permitted—and international community development professionals are big on citizen participation—takes a step toward community improvement. After some decades of experience in international community development, I think the world is reconsidering some of these ideas.This is especially true of the role of the external change agent. Today we realize that an internal change agent, such as Dr. Wangari Maathi with her Green Belt movement in Africa, can be tremendously effective. It's time for the "developed" nations to partner with already successful projects such as this one only if and when asked, not try to control them. While the international community development field started out in an eclectic fashion, borrowing from many different disciplines, real progress on the ground has sometimes seemed elusive. For example, Africa formed many democracies, but corruption too often became common. Then AIDS hit, followed by terrorism, deforestation, and famine. Civil wars might come and go, but the reformers sometimes were no better at governing than the preceding regime. These difficulties have led to healthy self-questioning about the belief in an all-knowing external change agent. It's our opinion also that the entry of major new philanthropic foundations into international development, and the smaller but more targeted U.S. government investments in international projects, have uncovered much new evidence about what has been effective. Also accounting for shifts in attitudes and sharpening of perceptions of what is actually needed is the speed with which new information is transmitted through cell phones and social media, a dramatic increase in open and curious minds trying to discover conditions first-hand rather than seeing through the lens of Western superiority, and the general rise of democracy and more open societies. So perhaps many possible blends of Western experience and resources with traditional values can generate successful lives around the world. How Would You Know When International Development Is Successful? The idea of societal success itself is subjective and culturally influenced. 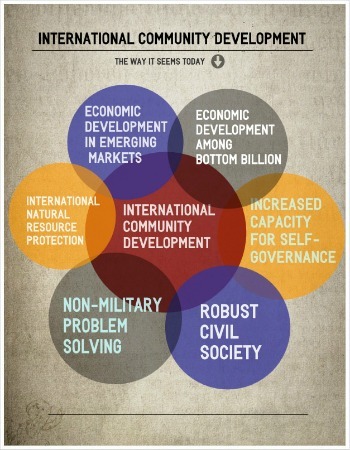 For all these reasons, international community development is headed toward new and more fragmented theory. The already abundant variety of definitions of community development will become even more pluralistic. Community development outside the so-called developed nations will need to focus explicitly on poverty and the informal communities (variously described by others as favelas, makeshift settlements, or less flattering terms such as suburban slums) that are arising outside most major cities in the developing world. Shack/Slum Dwellers International is sponsoring an interesting data collection project on settlements of the urban poor in Africa, Asia, and Latin America. Learn more about the Know Your City project if you are working in these areas. The United Nations-facilitated Sustainable Development Goals superseded the Millennium Promise goals in 2015. The new goals are even broader (17 goals now, as compared to the 8 MPGs from 2000) and more ambitious than the previous version, but add much-needed emphases on equity and peacemaking to the already robust agenda on poverty, hunger, and the like. The new goals are more realistic about the fact that huge intergovernmental transfers of wealth from the developed to the developing world are unlikely to happen, as are the anticipated mammoth investments by foundations. In spite of the transition to the Sustainable Development Goals, we still like and find relevant the Millennium Promise global poverty site, which we think is backed by a sophisticated but practical analysis of what is required to lift people around the world out of extreme poverty. It's just an opinion, but it seems to us that extreme poverty has to go away before many other international community development issues can be resolved. Simply looking at the Maslow hierarchy of values, people who aren't eating and who are disease-ravaged are unlikely to invent the battery that stops climate change in its tracks. A few books we recommend, each coincidentally with a wonderfully descriptive title, are The End of Poverty, The Bottom Billion: Why the Poorest Countries Are Failing and What Can Be Done About It, and Community Development in Theory and Practice: An International Reader. The latter is an anthology of articles from the Community Development Journal. One more book, specific to the southern hemisphere, is Megacities: The Politics of Urban Exclusion and Violence in the Global South. Another good resource is Britain's Overseas Development Institute. Isn't it wonderful that ordinary folks can now "talk" to people around the world, and make more realistic determinations about "what works?" Let’s do more of that. In fact, you can write something to share your ideas about international development with the world, and in effect expand upon or refute what we have said on this page, through our page on best international development strategy (click photo on the left).